I have maintained an uninterrupted love affair with the contemporary folk music sound I first heard as a child in the 1960’s. I have never stopped being a fan, first and foremost. However, around the age of eighteen, I discovered that in addition to learning how to play some of my favorite songs from records and the radio, I could write songs of my own. Over the past forty years or so, I have written numerous songs, performed alone and with others, and have now just recorded my third CD. 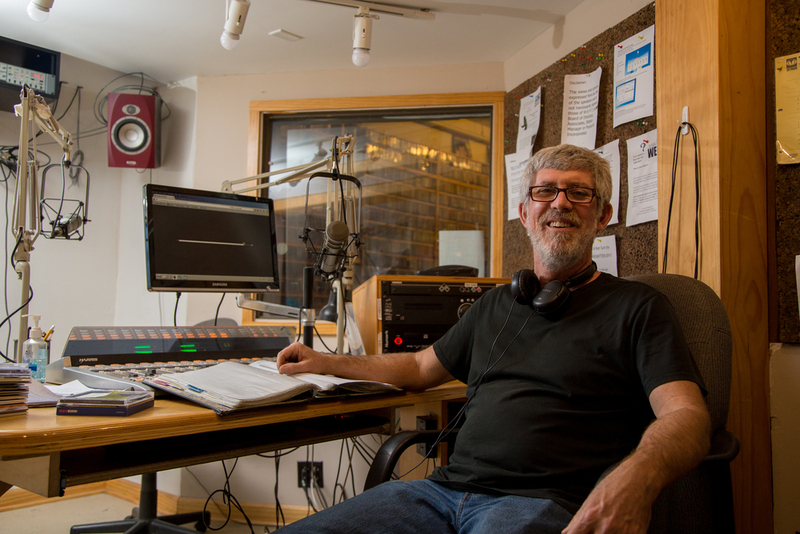 I have been doing my weekly radio show, From the Joshua Tree Inn, for twenty years now, on community radio 90.1 FM, WEFT, Champaign, IL. I enjoy the show as much now as I did on the day that I started doing it. It is part of the fun to correspond with hundreds of musicians, scour music magazines and websites, contact record companies and track down indie labels, listen for hours on end, and then cull the best of the best, to be included in my two-hour show each week. In addition to much appreciated regular local listeners, I have been able to connect with similar-minded folks around the globe, through webcasting, social media, and the posting of my playlists, which I have sent out one way or another for almost the entire tenure of the show. It has brought me lots of new friends, helped spread a lot of music, and influenced a few people here and there. Bottom line, I have a blast doing it. A little over thirteen years ago, I took a chance and quit my job as a director of an inpatient psychiatric program. I opened a private counseling practice in a small office in a funky, historic old building in downtown Champaign, IL. With guidance from friends and colleagues, and the support of my wife Sandra, I learned the ropes of running a therapy practice, and gradually began building one, starting (of course) with one client. Well, it worked out pretty well! In the past year, we bought our own building near downtown, are employing a full administrative staff, and have an eclectic group of over twenty-five therapists, serving hundreds of clients, and scheduling thousands of appointments each year. In fact, it has gone so well, that I have been on an extended sabbatical, attending to some of those other roads I travel. As before, I owe a debt to Sandra, who has taken over for managing the business without missing a beat (as a musician would say)! Please check out our page and our place … pretty cool, if I do say so. Thanks to the fact that I was able to take the time off of work, while Sandra held down the fort, and owing to another fact, that I wasn’t getting any younger, in 2014 I was able to complete an adventure that I had wanted to do for years. I shipped my bicycle out to San Francisco, flew out to meet it, and then proceeded to bike over three thousand, four hundred miles, ending up in New York City about a month and a half later. Over the course of the trip, I traveled through fourteen states, had a few flat tires, rode in the rain a few days, sweated through many days that were over a hundred degrees, climbed over four mountain ranges, and experienced drought, a wildfire, flash flooding, and a monsoon. I saw widely differing terrain, a huge variety of wildlife, and many kind and interesting people, including friends and family along the way. Oh, and found twenty-five pieces of silverware scattered along the entire route … but that’s a different story. Just as with almost all other significant endeavors in my life, I don’t know what I’m doing or where I’m going, but have decided to put some of it down on paper (or pixels). I have been a writer of one kind or another for a long time, not only of songs, but of stories, articles, reviews, even a thesis … but have never taken a stab at writing a book. That is now changing as I pursue two writing projects. One project is a narrative of my adventures while crossing the country by bicycle in 2014. The other is fiction, but is closely based on other real-life adventures, which took place during my misspent youth, and involved comedy, tragedy, trauma, heartbreak, absurdity and ultimate survival and redemption. Many antagonists, even more protagonists. And LOTS and LOTS of stories. I’ll keep you posted. Finally, Sandra and I were watching Jeopardy, as we are wont to do, when one of the contestants described himself as a stay-at-home dad. I turned to Sandra and said, “I’m a stay-at-home grandpa.” This is my favorite road taken. Eli is four years old and is the apple of my eye. Of course, it’s all the more special because it’s a road shared with “grandma.” In fact, that road began twenty years ago when I met Sandra and haven’t turned back since. My relationship has also deepened with my stepson Kyle … not to mention his partner Farron, and Farron’s other kids, Lucas and Janeya. Makes me appreciate my parents more, and my sisters, and my nieces and nephews, and my in-laws, and who else? Friends, colleagues, clients, listeners … maybe even readers? But, mostly being grandpa … and I like that stay-at-home part, too.